Matthew Stevens and Ding Junhui both made maximum breaks on the first day of PTC12 at Sheffield. Congratulations to both! The two players clashed in the last 16 of UK Championship last week and both knocked their maximum break today. The first was from Matthew Stevens during the third frame of his first round match against Michael Wasley, his first 147 in his career, the second Welsh to produce a maximum after Mark Williams at the Crucible back in 2005. The second maximum by Ding Junhui was made an hour after Steven's. Ding made it in the third frame and went on to win the match over Brandon Winstone. 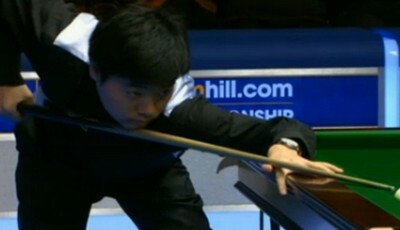 Ding has recorded two maximum breaks before including on 2007 Masters and 2008 UK Championship. Stevens and Ding will share 500 pounds for the prize. However, the two players lost in the last 16 to David Grace and Ricky Walden respectively. Mark Allen, the runner-up of UK Championship last week continued his good form to reach the last 16 stage of PTC12 in Germany and so did Mike Dunn, seeing off Mark Williams and Liang Wenbo today. Martin Gould, Xiao Guodong and Joe Perry are the players who are also through.